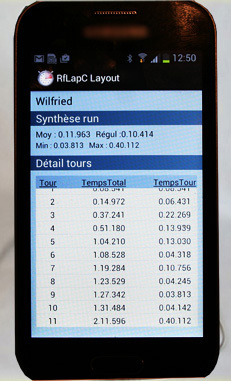 This android application allows to do timings on track with a smartphone. The recorded results can be loaded on the software 'Rf LapC Training' in order to be analysed. - Permanent database that can contain 50 drivers and 20 tracks. - Recording of the drivers personal records. 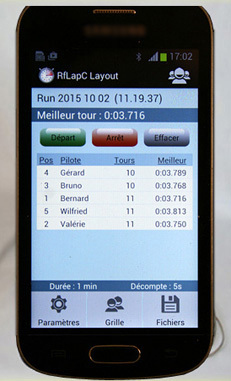 - 2 modes of operation : 'training' (individual timing) or 'race'(groupstart). - Parameters of race : runs duration 1 to 99 minutes or 1 to 99 laps. drivers classification according to their 'nber laps +time' or according to their 'best lap'. - Vocal annoucement of the laptimes. - Possibility of saving/loading each run. - Possibility of exporting the runs to the software 'Rf LapC Training for analysis. - Possibility of exporting the database.